There were Rock-N-Roll songs before “Rock Around The Clock,” some of higher quality, some with more artistic influence, some not as olden-sounding today. 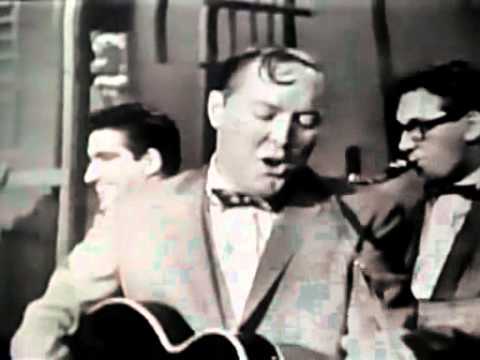 But it was Bill Haley & His Comets’ signature song that surrounded the Jericho of staid American taste and sounded the trumpets that brought the walls down. For that alone “Rock Around The Clock” finds a firm seat at the table of top 10 rock songs of all time. Haley and his boys also paved the way for all the white artists working in the Rock-N-Roll or R&B genre to become superstars. Moreover, “Rock Around The Clock” tapped into what was still a relatively new phenomenon - American teenagers as a discreet cultural group with tastes, urges and styles completely different from those of their parents. Although it is at first hard to discern, the song is in a very traditional 12-bar blues configuration simply sped up to a dizzying dance-beat pace with the addition of a muscular backbeat. It's music that makes you jump out of your skin. One of the two dozen-plus record jackets for "Rock Around The Clock"
“Rock Around The Clock” was recorded in 40 minutes, taking a scheduling back seat to “Thirteen Women,” the song that was intended to be the A side of the Comets’ single. So rushed was the effort that on the first take the sound levels weren’t checked, a mistake that gives the song its distinctive “live” sound, one that makes it seem even more anarchic than it would have been had it been recorded in a more leisurely way. There were two takes, one with the full-on volume levels that drowned out Haley’s voice, and a second take with minimal instrumental backing and Haley’s voice out front. Using the rudimentary technology of the day, (namely a razor blade and Scotch tape), a finished product was spliced together. A session guitarist, Danny Cedrone, laid down the two now immortal lead breaks in “Rock Around The Clock.” The first is jazz-inspired – call it boogie-woogie – while the secondary break is a down the scale run performed at breakneck speed. Unfortunately it is difficult to hear on the messy mix of the original recording. Jimi Hendrix has cited the Cedrone break as one of his most important early inspirations. Many commentators have said that the guitar breaks in “Rock Around The Clock” are the prototypes for every Rock solo that followed. “Rock Around The Clock” was recorded on April 12, 1954. On June 17, Cedrone fell down a flight of stairs, broke his neck and died, never witnessing the “meteoric” impact of his work. He had been paid $21 for his work. The revolutionary tune was recorded on West 70th Street in Manhattan at the Egypto-Assyrian fantasy building that was the Pythian Temple’s main auditorium, which had been functioning for years as a sound studio. As so many other halls have been, it was touted as having perfect acoustics. Perfect acoustics were unecessary for Haley’s landmark work. When first released by Decca records in May of ’54, “Rock Around The Clock” sold a disappointing 75,000 copies. It had all but faded from the public’s mind when, in early 1955, Glenn Ford, acting the lead in a juvenile-delinquent themed flick, Blackboard Jungle, grabbed a handful of 45s from his son’s collection in order to bring them to the movie studio so the director could audition some teen music for the movie’s opening credits. Of course “Rock Around The Clock” was chosen. By July of ’55, due to the popularity of Blackboard Jungle, “Rock Around The Clock” became the first Rock-N-Roll song to sell one million copies. “Rock Around the Clock” has been reincarnated, re-recorded, re-mixed and used for countless purposes. Its artiest use was in the film classic, American Graffiti. Its most famous and most recognizable use has been as the opening theme for TV’s long-running sitcom, Happy Days. Each time “Rock Around The Clock” was re-launched it sold hundreds of thousands more copies or helped pull along the freight of Rock-N-Roll anthologies and other compilations. It is estimated that Bill Halley & His Comets' most lasting contribution to American culture has sold over 7 million copies in one form or another. It has been covered over 700 different times, 30 versions being issued by Haley himself. And, like another American cultural icon from the same period, television’s venerable I Love Lucy, every minute of every day, somewhere on the planet, “Rock Around The Clock” is being played even as it grows close to 60 years old. There are many definitions of “classic Rock song.” But, if “Rock Around The Clock” doesn’t qualify, no song does. Decca Records America recorded and issued the first recording of Bing Crosby’s “White Christmas,” the biggest-selling song of all time. “White Christmas” and “Rock Around The Clock”? Seriously? Decca turned down The Beatles for a contract but later signed The Rolling Stones. Was It Rocket 88 Or Not? Ike Turner puts to rest the question of whether "Rocket" was the first R&R song. Or does he? 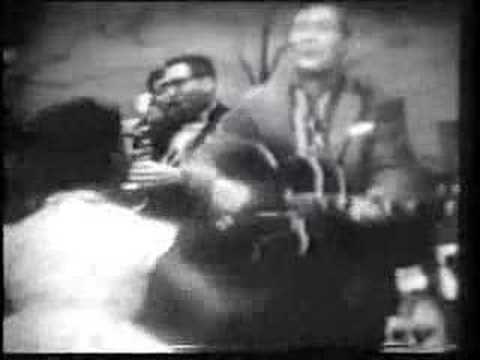 Perkins struck one of the matches that touched off the cultural revolution that became Rock-N-Roll. It didn't quite put the ram in the rama lama ding dong, but it's the song that put the happy right into "Happy Days." It rocks with the fury of pent up youth. The vocals are rousing, raucous, lightly bitter, and belted out with reckless abandon. It feels organic as hell, despite the synthetic, better-living-through-modern-chemistry LSD side of the song.